Add a uniquely hoppy kick to your next cookout with this set of barbeque sauces infused with craft beer. 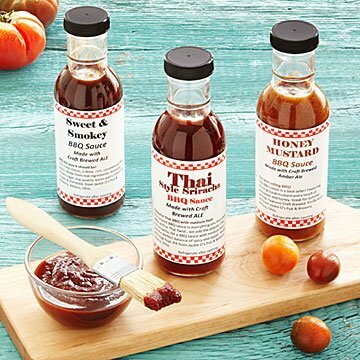 Add a uniquely hoppy kick to your next cookout with this set of barbeque sauces infused with craft beer. The set of three sauces—Thai Style Sriracha, Honey Mustard, and Sweet & Smokey—feature the malty magnificence of amber, IPA, and porter from Jackie O's Pub & Brewery in Athens, Ohio. It makes a great gift for any beer-loving grillmeister. Made in Athens, Ohio. 8" L x 8" W x 3" H; Each jar contains 12 fl. oz. I would order the product again. Bought these as a fun gift for my fiancÃ©, and he LOVES them! We use them a lot on grilled chicken, but he likes it for dipping in and for other meats too. Unique flavors and a unique gift. Would buy it again! I purchased this BBQ set for a co-worker and have not presented it to him yet. He is a Grill-master so I really think he will enjoy this fun gift. Perfect gift for a griller! He loved them and was so excited to try them out soon!